discover Our 5 rooms - De website van ammeerturm! 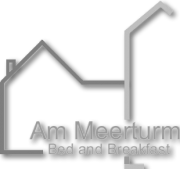 At B&B Am Meerturm you can book two different room types: Our Double Rooms and our Comfort Double Rooms. Do you have a preference for a specific room? Please let us know as a remark during your booking. 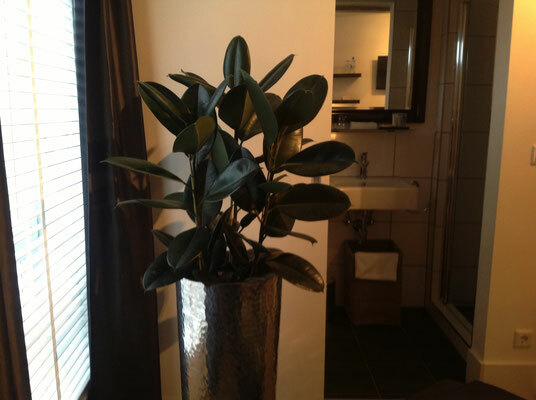 Depending on the availability, we will do our very best to consider your preference. 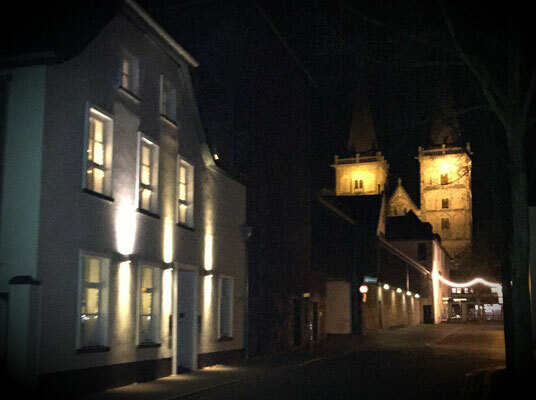 "Dom" is the German word for cathedral and "Zimmer" translates to room: the Cathedral Room. This Comfort Double Room is located in the main house right next to our breakfast lounge. 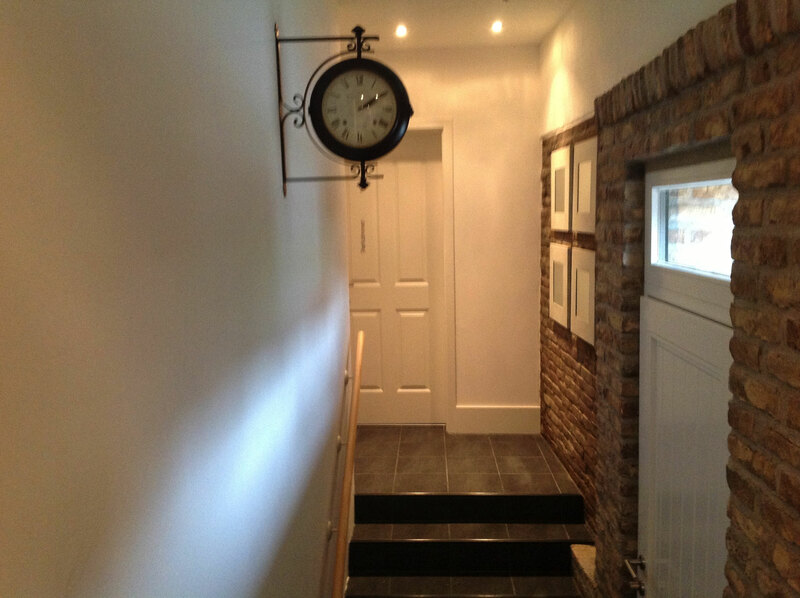 Thick walls and well isolated windows eliminate noise from outside. Make use of the wireless internet, tea/coffee facilities and hairdryer. If you wish, we can prepare the beds as two single beds as well. 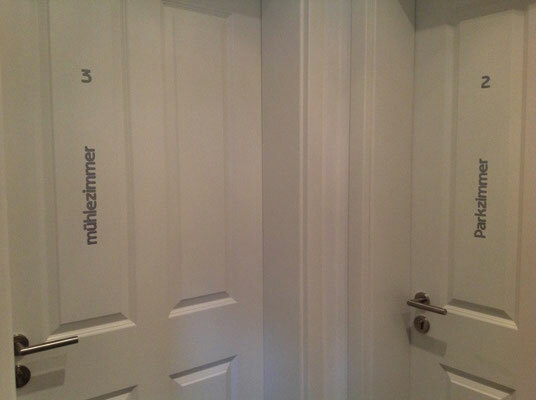 This room is suitable if you are less mobile. Relax on our 2 x 1 hotel quality boxspring beds. The Domzimmer is furnished with a cozy sitting area, a wardrobe and a flat screen TV. Feeling the history already? You sleep literarily right next to the 2 meter thick wall of the ancient Meerturm (1389) built in the Medieval Period. The room has a private bathroom with a sink, toilet and shower ( 90 x 90 )and fresh towels and our Spa Collection set consisting of soap, lotion, shampoo and conditioner is waiting for you so you can relax after a day of museum touring, nice walks or a cycling tour. "Park" is the German word for park (easy right?) and as you already know, "Zimmer" translates to room: the Park Room. 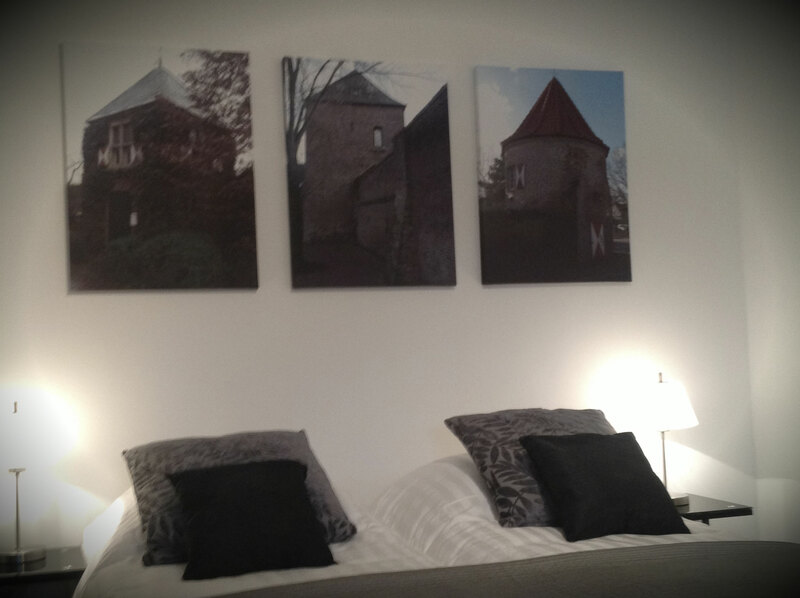 This Comfort Double Room is actually and literally located in the city wall behind the Meerturm. 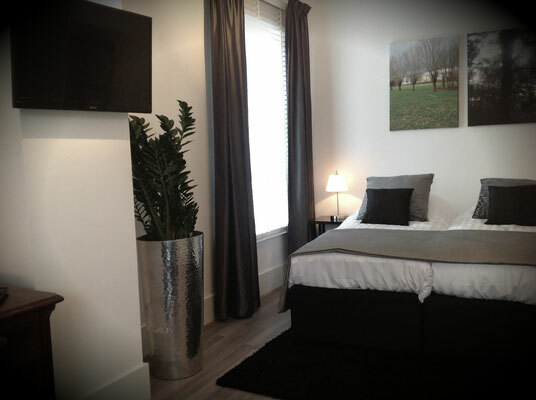 The room is suitable for lovers of the peace & quiet with a view across the park by 2 windows. You sleep in our elevated 2 x 1 boxspring beds of hotel quality, with anti-allergy pillows, duvets and bed linnen of superb quality. The beds can be put apart if you like. The park around the old city is being renewed and renovated at this moment to make it even more beautiful and nice to walk enjoying the colors and the sound of the birds. "Mühlen" or better Mühle (a grammar thing) is the German word for mill and yes, you know that "Zimmer" translates to room: the Mill-Room. 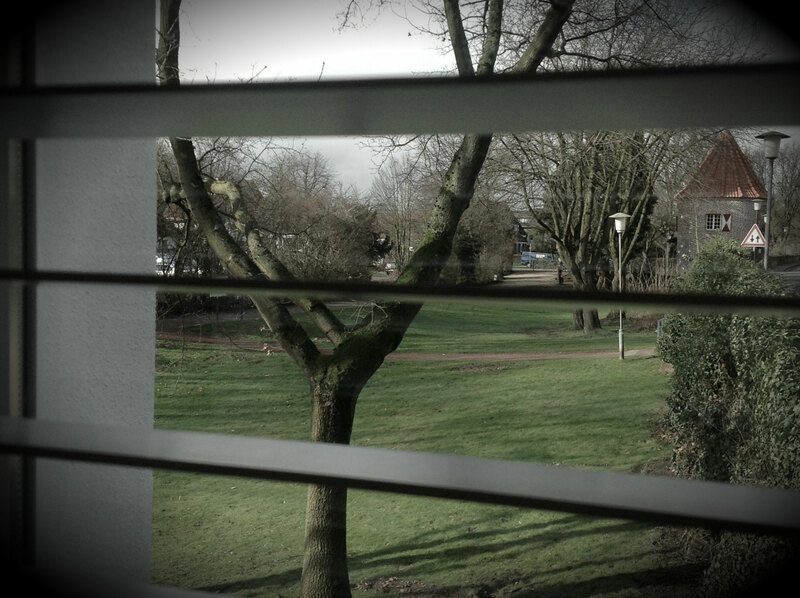 Ok, so we are Dutch (moved to Xanten a while ago) and have still some kind of thing going on for mills. Naturally, there has to be a mill room in our B&B. 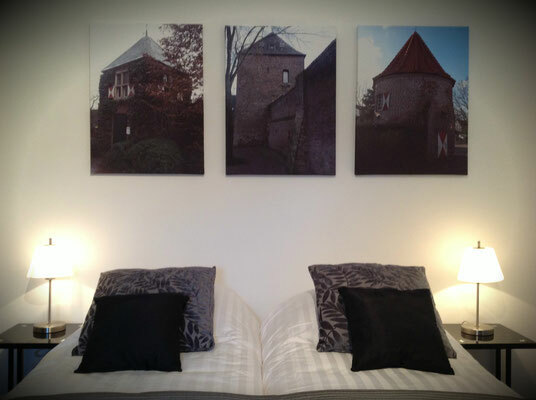 This double room is also located actually and literally located in the historic city wall behind the Meerturm (1389). The room is quietly situated and has a view across the park. 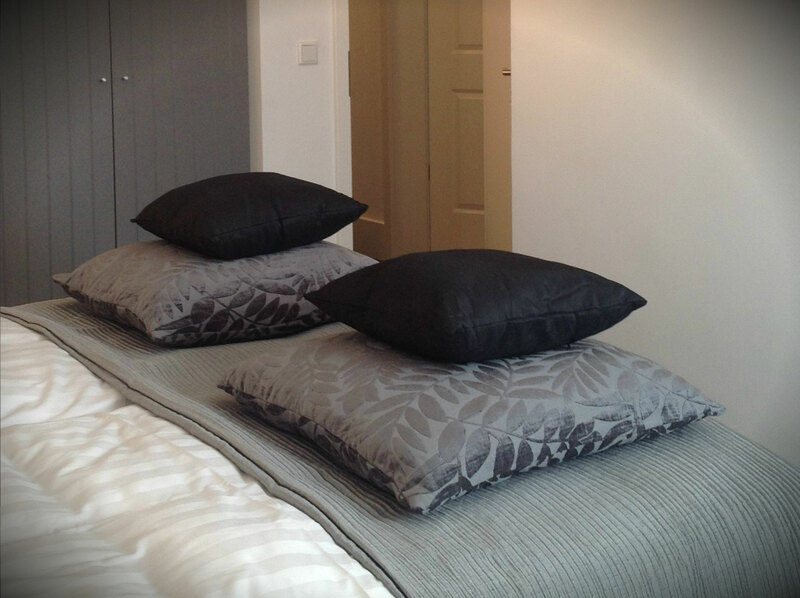 Rest in our 2 x 1 hotel quality boxspring beds with anti-allergy pillows, duvets and super comfy bed linnen. Of course, the beds can be put apart if you prefer. The 'Mühlenzimmer' has a private bathroom with a sink, toilet and shower ( 90 x 90 )and fresh towels and our Spa Collection set consisting of soap, lotion, shampoo and conditioner is waiting for you so you can relax after a day of museum touring, nice walks or a cycling tour. One of the 2 famous mills in Xanten is about 500 mars away from your room. If you would like to hear her story you can climb the mill and have her story told by the miller himself. Get a good night rest in our hotel quality boxspring bed, with anti-allergy pillows, duvets and bed linnen of good quality. The beds can be put apart if you like as well. The room has a private bathroom with a sink, toilet and shower ( 90 x 90 )and fresh towels and our Spa Collection set consisting of soap, lotion, shampoo and conditioner is waiting for you so you can relax after a day of museum touring, nice walks or a cycling tour. Pictures of the Colosseum above your bed to prepare your journey in the Archeological Park of Xanten where one of the biggest cities of the Roman Era was found and where archeological are looking for new treasures every day. 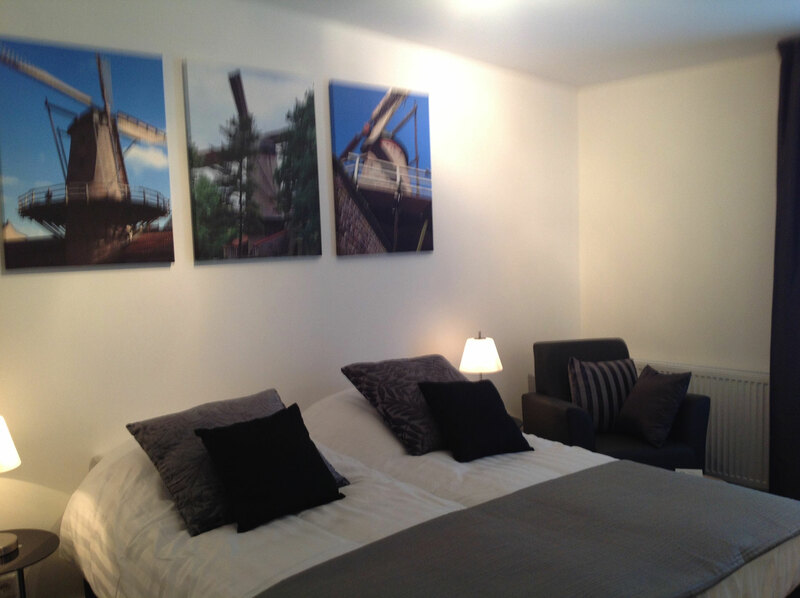 Rest in our 2 x 1 hotel quality boxspring beds with anti-allergy pillows, duvets and super comfy bed linnen. Of course, the beds can be put apart if you prefer. The 'Turmzimmer' has a private bathroom with a sink, toilet and shower ( 90 x 90 )and fresh towels and our Spa Collection set consisting of soap, lotion, shampoo and conditioner is waiting for you so you can relax after a day of museum touring, nice walks or a cycling tour.